(Reuters) - General Electric Co reported a smaller-than-expected drop in profit on Friday, but cut a key financial target, raising questions about its full-year outlook and sending shares sharply lower. The 126-year-old industrial conglomerate, whose power and financial-services units are struggling, said it expects to generate perhaps $1 billion less free cash flow than expected this year. The forecast cast doubt on GE's full-year adjusted profit target of $1.00 to $1.07 a share. Though GE affirmed that target on Friday, many analysts see it as unrealistic and have cut their estimates to less than $1.00. "We are getting questions as to how the company can maintain EPS guidance while cutting free cash flow guidance," JPMorgan analyst Stephen Tusa wrote in a note on Friday. GE's conference call with analysts also cast doubt on the outlook. "They gave you all the conditions for why the forecast could go down," said Deane Dray, analyst at RBC Capital Markets. For example, GE had previously said it expects to ship 50 to 55 large power turbines this year. "On the call, they said 'We're targeting 50.'" GE also said power equipment sales may take longer to close. "The only thing you're going to hear from that is there's downside risk," Dray said. The stock was down 5.2 percent at $13.02 in midday trading. The stock decline was "all about cash and (GE's) acknowledgement of risk to the second half," said Jeffrey Sprague, analyst at Vertical Research Partners. GE cut the industrial free cash flow target to $6 billion from a range of $6 billion to $7 billion. Its adjusted earnings, which exclude certain pension and restructuring costs, fell 10 percent to 19 cents a share, beating analysts' expectations of 17 cents a share, according to Thomson Reuters I/B/E/S. GE said weakness in power and renewables energy offset gains in its aviation and healthcare units. A decade and a half ago, GE was the world’s most valuable public company. But the Boston-based conglomerate foundered in several industrial markets and its move into financial services steered it into the global financial storm in 2008. GE shares have halved in the past year. Though investors are still interested in GE, many want to see the power and capital units stabilize and even improve before buying the stock, analysts have said. "They didn't screw up," said Nick Heymann, analyst at William Blair. "This was a quarter driven entirely by aviation and healthcare." GE beat earnings expectations in part because it cut overhead costs more than expected and the losses at GE Capital were less than analysts expected, said RBC's Dray. The results capped an unusually busy quarter in which Chief Executive John Flannery announced a long-awaited plan to spin off its healthcare unit and sell its 62.5 percent stake in oil services firm Baker Hughes. In May, GE announced an $11.1-billion deal to merge its locomotive unit with Wabtec Corp. In June, it announced a $3.25-billion sale of its distributed power unit to U.S. buyout group Advent. GE also restated results for 2016 and 2017 to reflect new accounting standards. Last month, it was removed from the blue-chip Dow Jones Industrial Average. Finally, GE's top executive in Latin America was jailed in Brazil after prosecutors said he was involved in a price-fixing scheme for medical equipment. 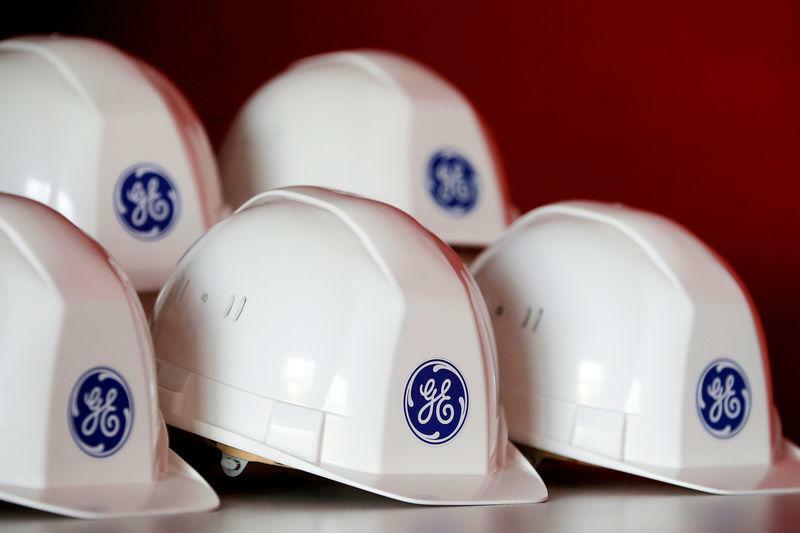 Losses widened at GE Capital, the company's financing arm, during the quarter. Power unit profit fell 58 percent in the quarter and orders there were down. GE's power unit is relying on services revenue to offset declining sales of new equipment. But the services business also is under attack from competitors in important markets such as Saudi Arabia. Earnings from continuing operations attributable to GE shareholders fell to $736 million, or 8 cents a share, from $1.03 billion, or 12 cents a share, a year earlier. One positive for GE: Adjusted free cash flow from industrial activities swung to a positive $258 million in the quarter from a negative $1.7 billion in the first quarter.